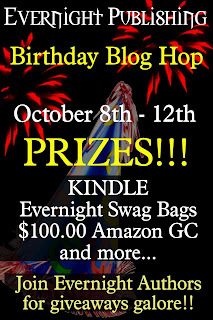 Welcome to the Evernight Publishing birthday blog hop! Evernight Publishing opened its doors two years ago. In those two years we’ve signed over one hundred and sixty authors and published over three hundred books. From paranormal to contemporary, we’ve had more best sellers than we can count and made thousands of people smile, sigh and gasp. So, as a thank you to all our readers and everyone who has supported us, we’re holding this blog hop and we have a whole lot of prizes to offer you. Here's how it works... the more blogs you hop to (shown below) the more chance you have of winning prizes. 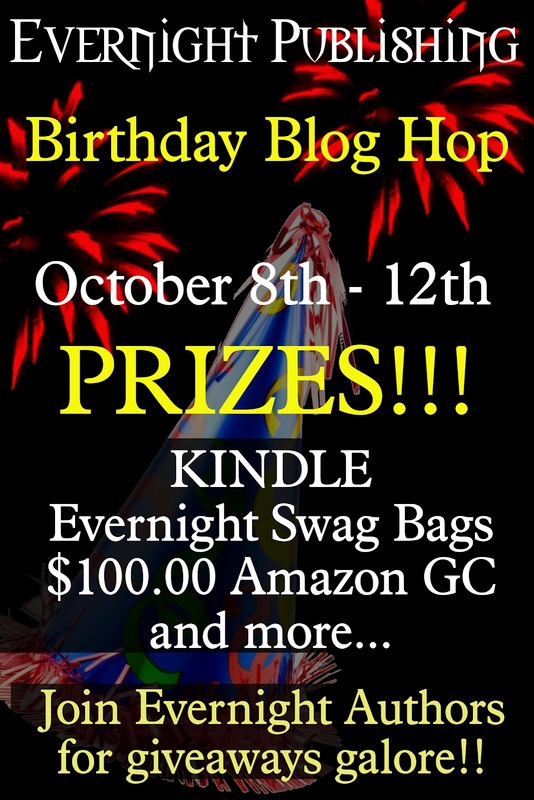 Each author on the hop is offering a prize and Evernight is offering the following grand prizes, a Kindle, a $100 Amazon gift certificate, two Evernight swag bags (which includes a tote, a tee, vouchers, a mug and other coolness) and a personalized Facebook banner. To be in with a chance of winning the author prize simply follow the blog you're visiting and leave a comment which includes your email address. Each entry on each blog is then counted towards the grand prize draw. The more entries you have, the better your chance of winning a grand prize! You also get extra points for liking the Evernight Facebook page http://www.facebook.com/#!/evernightpublishing. Just make sure you let us know in the comments that you've done so. Hello! It's Rebecca and I just wanted to let everyone know that in honor of Evernight's birthday I will be giving away two books of your choice to a lucky winner! All of my work can be found in the tabs so give them a browse and see which ones peak your interest! Also be sure to stop by all the other amazing blogs on the list below. Here's to a very Happy Birthday to Evernight! It is great so many authors are involved in this blog hop. We're just all so happy to have fans and readers to actually have this hop for! Thank you for being a part of the celebration! Love all the m/m...it'll be so hard to decide! Your books look really interesting. Please include me in your drawing. Thanks! I'm glad you think they look interesting and trust me you are in the drawing! I am a fan of Evernight on Facebook, and I follow your blog via GFC (mariehahn13). Happy Birthday Evernight and I follow on FB. I also follow you on FB and GFC. Thank you for being a part of the celebration!! Thanks for being part of this fun hop and the great giveaway. What a fun Blog Hop! This is such a great opportunity for readers to discover new authors! Love it! It's fun for the authors too since it lets us engage with the readers and even the other authors we haven't had a chance to speak with yet. Thanks for being a part of the celebration! Well I would love for you to read one of them as well! I'm glad you're enjoying the hop! Of course! Thanks for stopping by! This is a great blog hop. Congrats, Evernight! Ms. Brochu, Love in the Land of Fire looks scrumptious! Thank you for the opportunity to win. Oh I'm so happy to hear that you think so! Thank you so much for taking part in the blog hop! Yey, happy b-day to Evernight!! ;) Thanks for being a part of it! Thank you for the giveaway chance, Rebecca! You're a new author to me so I'll definitely check out your books! Happy Birthday, Evernight! Well I hope you like what you see! Thanks for celebrating with us! Happy Birthday to Evernight, I've enjoyed the celebrations and took advantage of the .99 amazon and ARe deals, picked up quite a number of books! :) I'm following you and Evernight on FB! I believe we all tried to take advantage of those deals! Thanks for celebrating with us! Thank you for celebrating with us!! Generous giveaway, I look forward to checking out your work! Well I hope you enjoy it!! Thanks for the amazing giveaway & Happy 2nd Birthday Evernight! Thank you for stopping by and celebrating with us! Happy 2nd Birthday Evernight!! I am a FB and Twitter follower of Evernight Publishing and I'm a GFC follower on your blog! Thanks for the chance to win! happy birthday evernight! Awesome blog hop! I follow evernight on FB. Happy birthday Evernight! Thanks so much for the giveaway! I'd love to read Love in the Land of Fire and A Wolf for Haru. Well I'm glad they've caught your interest! Thank you for stopping by! Thank you so much for the awesome contest and for participating in the hop! I follow Evernight on facebook. Happy Birthday, Evernight! My favorite part of birthdays are the spankings and cake!! That's our favorite parts too! Happy Birthday Evernight! I am a FB and Twitter fan of Evernight Publishing. No thank YOU for celebrating with us! Well I'm glad that you're enjoying yourself! Thanks for celebrating with us! Thanks for being on the hop! Happy Birthday Evernight!! I love finding new to me authors and sites. Well we love having you with us! Thanks for stopping by!! We're thrilled to have you with us!! Love hopping with the Evernight authors. Thanks for inviting us to celebrate your 2nd birthday. We love having you hop with us! Thank you for celebrating with us! Thank you very much for being with us! It's the readers who have allowed us to make it this far. Thanks for celebrating with us! Winner of Wolf at the Door!! Werewolves, Huntsmen, and Love Oh My! Ready for some steamy fang filled fun?